If you have answered yes to some or all of these questions then it is likely that further investigation from an RNR practitioner will reveal an immature central nervous system indicating the retention of some primitive reflexes. A. Ask the child to get on all fours with the arms straight, fingers pointing forward and the head in neutral. With their weight over their hands, the parent rotates the child’s head left or right. If their elbow bends on the opposite side of head rotation (as would in the infant) OR the weight shifts posteriorly (i.e. off the hands) then the reflex is probably present. B. Alternatively, have the child standing with arms straight out in front of them at shoulder height. Ask the child to turn their head fully to the left or fully to the right while maintaining the position of the arms out front. 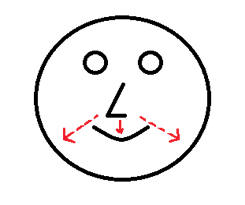 If the torso and arms turn in the direction of the head or if the arms drop this reflex is likely present. 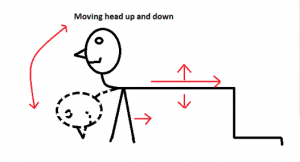 This signifies that the child has not yet disassociated neck movement from shoulder movement. A. Standing with the feet together, elbows bent and away from body with palms facing upward. 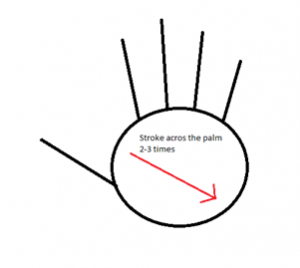 Gently stroke along the creases of the palm from between the thumb and index finger toward the heel of the hand. Repeat 2-3 times. If the thumb, fingers or elbows move inward then this reflex is probably present. B. Keeping the arms straight out in front, ask the child to wriggle all 10 fingers as though they were playing a piano. Watch for excessive wrist flapping being used instead of the smaller muscles of the hand or movement of the tongue and mouth. This reflex, if retained, can contribute to difficulty in writing and increased energy expenditure while writing or performing manual tasks. A. Lying face down on the ground with palms facing down ask the person to hold the head off the ground and raise the legs simultaneously keeping the legs straight (aka the superman). 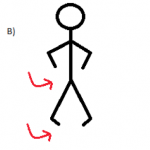 If they are unable to keep their legs straight then the Sagittal TLR is probably present. B. This one is great performed with music. Place a like-coloured sticker on the right hand and left knee and a different like-coloured sticker on the left hand and right knee. Ask the child to march on the spot as they tap their hand to their opposite knee as to match up the stickers. If they turn on the spot, their rhythm is off, or if they begin to tap the same-sided leg, this reflex is likely to be retained. This is a great way to detect gross motor control issues and if the child displays more difficulty when moving to the beat of the music it may signify auditory processing issues. A. Ask the child to walk forwards and backwards with their feet turned outwards (aka duck walk). If you notice any of the following it would indicate poor upper/lower body dissociation and body awareness. B. 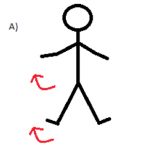 Ask your child to walk forward and backward with their toes pointing in (aka pigeon walk). If you notice any of the following it would indicate poor upper/lower body dissociation and body awareness. Of course if you have any suspicions that your child may still be displaying these reflexes (whether by answering yes to some or all of the above questions, by noticing some of the symptoms outlined in each of the reflexes or by performing some of these at home tests) then click here to go to the ‘locate a practitioner’ page on this website and find a practitioner to help treat your child. It is our belief that although specific exercises will help, true primitive reflex integration comes from the Retained Neonatal Reflex technique. This is because the RNR technique addresses the primary reason the primitive reflexes failed to be inhibited due to poor cranial movement and neuro-dural tension. Biomechanical contribution to behavioral and learning difficulties has gained acceptance by health professionals worldwide. Rehabilitating children with an immature central nervous system (CNS) can require the assistance of many health practitioners. These include but are not limited to Behavioural Optometrists, Occupational Therapists, Physiotherapists, Dieticians, Naturopaths, Sound Therapists, Play Therapists, Paediatricians and General Practitioners.